Much as with the Samurai Jack comic that I’m reading these days, published by IDW and written by Jim Zub, the most important element for a tie-in comic like this is that the tone of the characters and the setting is maintained. If that element is missing, then it doesn’t feel real. That element is the biggest draw of these characters and the setting so missing out on that is like not having a heart. Or something to that effect. 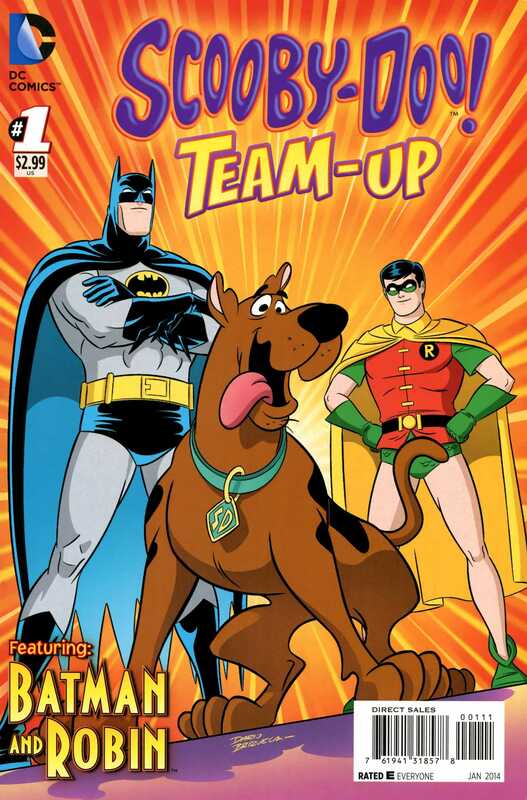 This is where Fisch steps in to deliver a really fast-paced story that is true to the roots for both sets of characters, the Mystery Inc. gang and Batman and Robin. The premise here is simple. Man-Bat has left Gotham to go terrorize a new city and the dynamic duo of Batman and his trusted sidekick have followed him over. In addition, the gang is investigating reports of a giant bat-creature haunting the city. The two teams end up crossing paths and lots of hijinks ensue as they attempt to stop an in-progress robbery at a shopping mall, the robbers being rather familiar to all involved. There’s not enough good things to say about this comic. It was pure fun. Much better in many respects than the other DC animated tie-in I’m reading at the moment, Beware The Batman, although its not on par with Samurai Jack, not quite. Still, this is unadulterated fun that hits on the key defining elements of both shows. Like all the dialogue between Shaggy and Scooby when they have to go in and confront the bad guys, or the infamous catch-phrase that Robin used in the live-action show, or the villains doing their whole “and I’d have got away with it too…” line, except that everything has small twists of sorts. Fisch makes it clear at every turn that this is well and truly a fun team-up and she keeps all the characters at the forefront of the story throughout. One thing leads to another leads to another and by the time I was done with the issue, I was almost sad. I ended up curing that by listening to the theme music from SDWAY, which helped immensely. The art here is by Dario Brizuela with colours by Heroic Age and letters by Saida Temofonte. The fun thing is that visually, the comic most definitely hearkens back to the shows and the characters are all instantly recognisable to the point that I kind of got a little emotional too. Watching SDWAY for years will do that to you, I suppose. Brizuela’s art and Heroic Age’s colours always stress that this is an all-ages comic that adults can also enjoy for its simplicity and therefore everything here is toned down, when it comes to the Bat-verse. Man-Bat for instance looks very imposing, but he isn’t the out-and-out monster he is in the mainstream Batman comics right now. Bright, bold colours that stand-out and characters striking some classic poses. This book has everything you could want from it. And that’s the point isn’t it? I had fun reading this issue, and I think I’m definitely around for a few more, as long as they are consistent. I loved this. Takes me back years to the really good times. Won’t argue against that. Posted on November 26, 2013, in Comics Reviews, Review Central and tagged Animated Series, Batman, Batman and Robin, Cartoon Network, Comics, Comics Review, Daphne, Dario Brizuela, Fred, Heroic Age, Man-Bat, Mystery Inc, Private Investigators, Review, Review Centrail, Review Central, Robin, Saida Temofonte, Scooby-Doo, Scooby-Doo Team-up, Scooby-Doo Where Are You, Shaggy, Sholly Fisch, Velma. Bookmark the permalink. 1 Comment.